Signature of the authorized person declaring the weight and company details. Who is Responsible for declaring and providing the VGM? 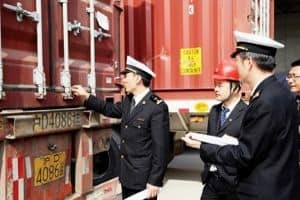 Under the SOLAS requirements, the SHIPPER named on the ocean bill of lading is the party responsible for providing the maritime (ocean) carrier and the terminal operator the verified gross mass of a packed container. A forwarder will be responsible for reporting this on a clients behalf from the declaration received from the shipper. How Can I weigh a container? Once the container is packed a shipper may weigh or arrange a third party to weigh the packed container (at a cost). Or The shipper may weigh all packages and cargo items, including the mass of the pallets, dunnage and other packaging, and add the tare mass of the container to the total. Where can I obtain the tare weight of a container? The container’s tare weight is shown on the door of the container. What is the deadline to submit the VGM to the forwarder? Cut off time will vary from port to port please check with your forwarder at time of shipping. What are the consequences if the VGM is not reported in time? The carrier and the terminal operator may not load the container on board the vessel.